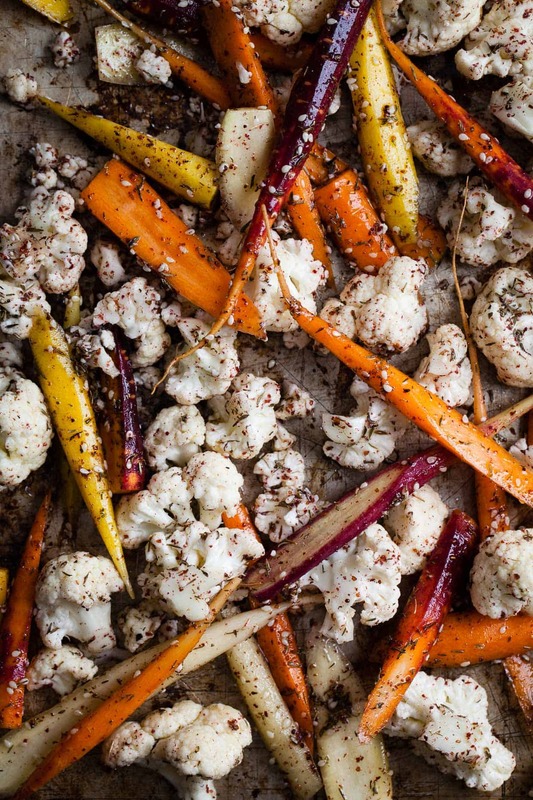 I dedicate these za’atar roasted carrots & cauliflower to our cats. Have you ever crossed paths with a hungry cat? An empty bowl can signal that they might never ever EVER get food again, so they must HOWL at their human to communicate the dire situation. My mom’s cat Otis used to wake her up screaming in her face until she’d drag herself out of bed. And he wouldn’t stop meowing in tow until his bowl of wet food hit the floor. You will suffer through their hunger with them. This is not my morning wake-up call though. Some mornings, Aioli will hop up on the bed and every-so-gently rub her head on me to request loving pets, all the while purring so softly. If I don’t respond, she’ll perch on top of me and continue purring. When she first started this doting feline attention, I felt like the luckiest kitty mama around. Until I noticed a pattern between her sweet morning affection and their empty food bowl. Like clockwork, her behavior has become routine – if I get morning kitty love from Aioli, it means I’ve let their food run dry. She’s trained me and I don’t even care because: kitty love is the best way to wake up. Always. She never meows and is never rude. And when they finally get food, she always lets her brother eat first, while waiting patiently in line behind him. It turns out we’ve got a pair of polite little kitties. Though they’re not without a streak of mischief. Arti definitely stole one of these vibrant carrots off the table by snatching the long leafy tops between his teeth and scampering off. And Aioli has been known to help herself to a lick of yogurt if left unattended. And so – this dish is dedicated to their tastes. With the exception of dips or dressings, I usually reserve yogurt for the sweet side of things – topped with granola and a heavy dose of blueberries, mixed into a morning smoothie, or with a thick layer of burnt sugar on top for a slightly healthier crème brûlée. Until recently, that is, when I was served a dish with a layer of salted yogurt beneath a bed of roasted carrots at a luncheon with Todd and nearly licked my plate clean (I’m classy). 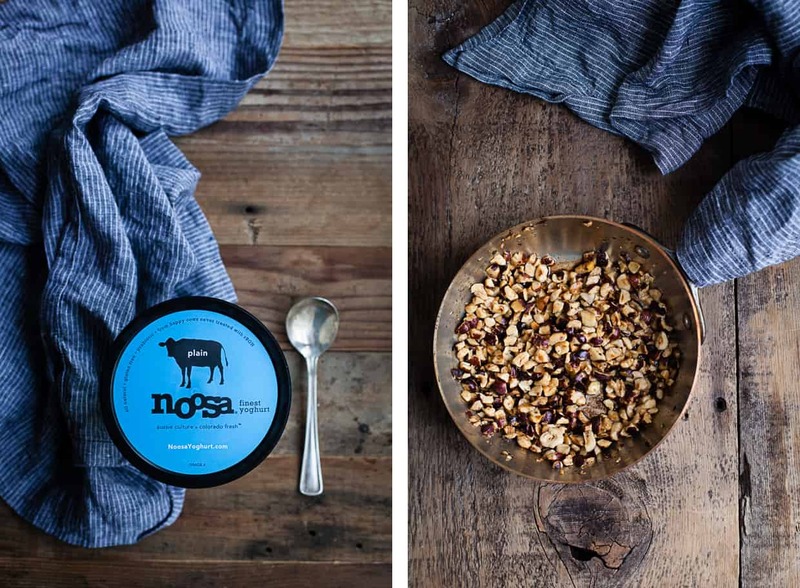 So when noosa challenged me to make a recipe featuring their velvety yoghurt, I knew I’d be going for the unpredictable salty savory route. 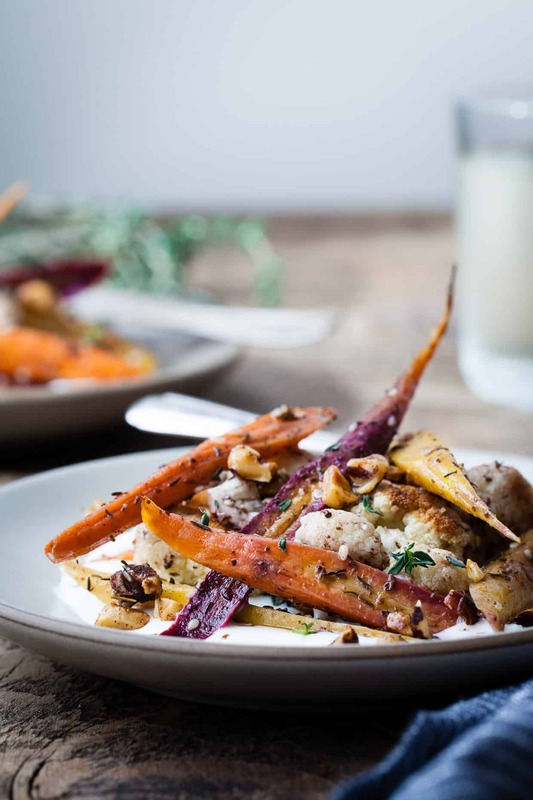 Their plain yoghurt is thick and smooth with just the right amount of tartness to make it the perfect pairing for some tangy herby roasted vegetables. 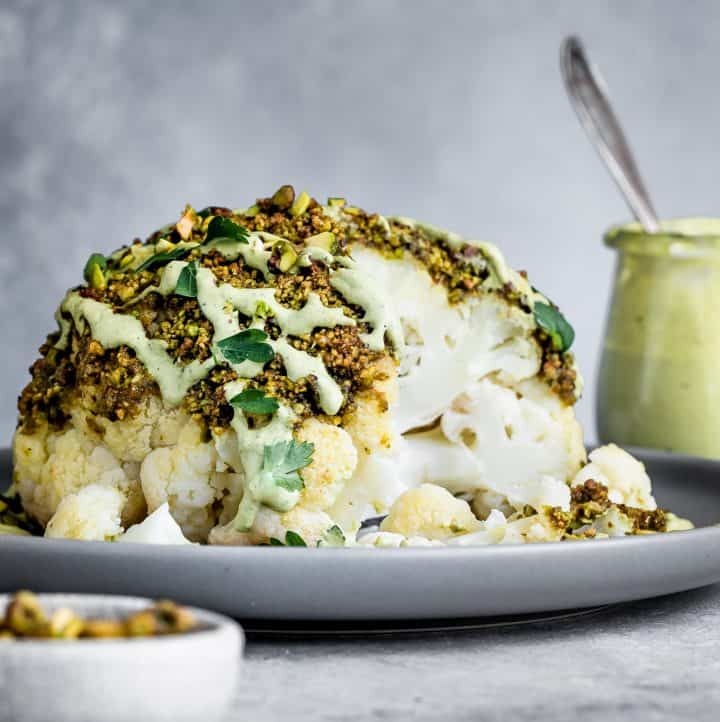 For their part, the veggies were tossed with za’atar – a Middle Eastern blend of spices typically made up of sumac, thyme, sesame seeds, and a bit of salt – for a complex lemony, savory, & nutty flavor that sings against the tart salty yoghurt. A handful of cinnamon roasted hazelnuts thrown on top ties it all together with a warm roasted crunch. An untraditional side to your Thanksgiving feast! ¼ teaspoon kosher salt, or more, to taste. 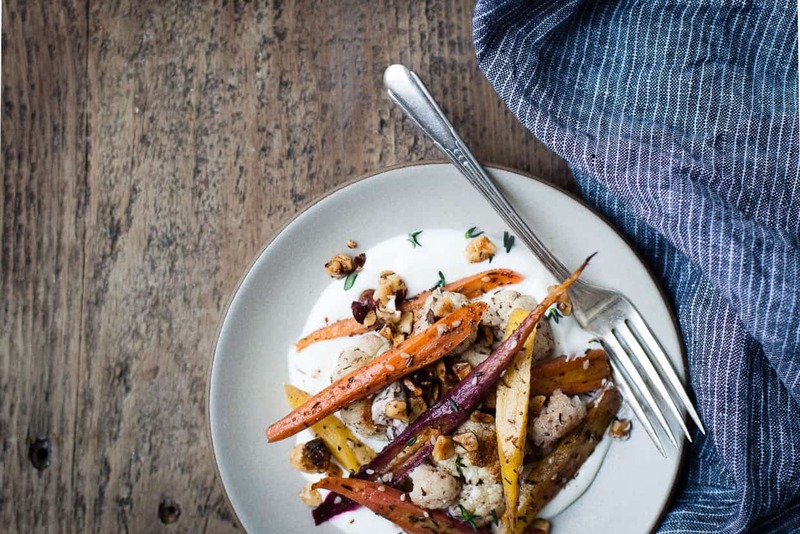 Toss the carrots and cauliflower florets with olive oil, sumac, thyme, sesame seeds, and salt. 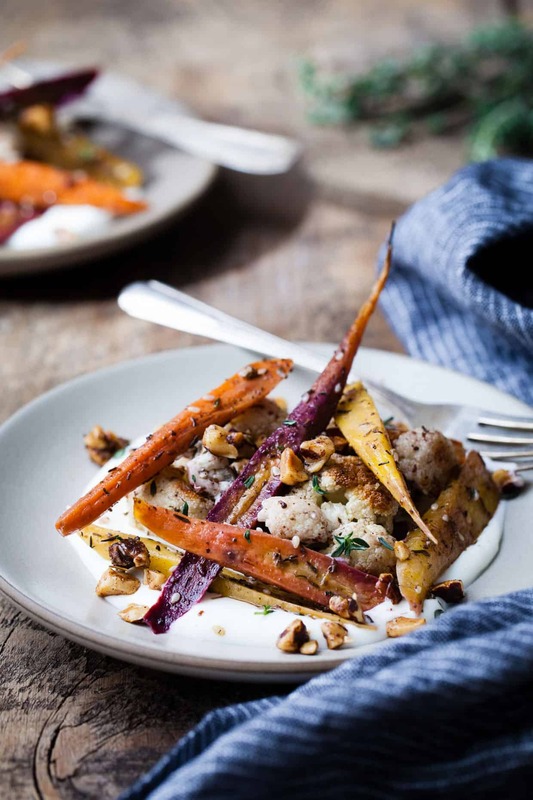 Spread them out on a parchment-lined baking sheet and roast veggies for 12-15 minutes, until the carrots are tender, but still have a bit of crunch. Transfer to a bowl and refrigerate for at least 25 minutes, or overnight. Meanwhile, stir the plain yoghurt with with lemon zest and salt. Taste and adjust salt as needed. Refrigerate until ready to serve. Melt the butter in a small skillet over medium heat and cook, stirring occasionally, until the butter foams and turns lightly golden brown. Add the hazelnuts and cinnamon and cook, stirring for 1 minute longer. When the vegetables are chilled (just above room temperature is fine! ), spread the salted yoghurt on a serving platter. 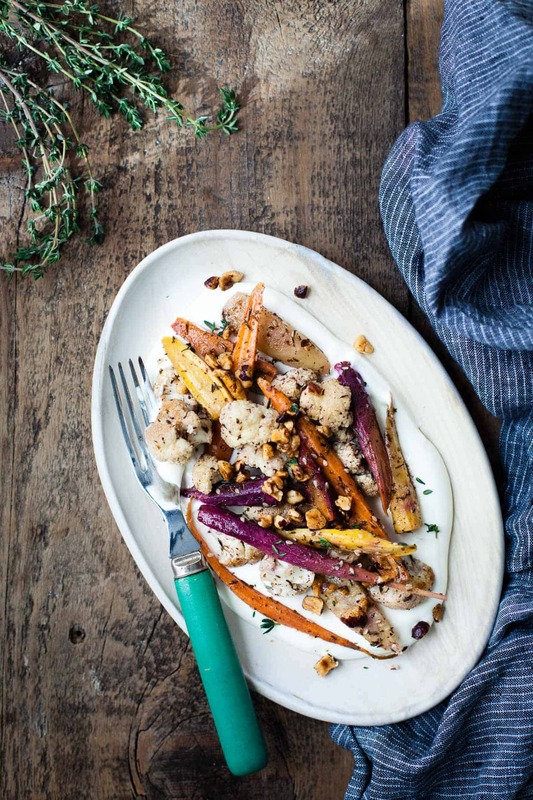 Top with roasted vegetables, cinnamon roasted hazelnuts, and garnish with fresh thyme leaves. Serve cold or room temperature. Sumac is a vibrant red spice that's a bit tangy and lemony. You can find the Spicely brand of ground sumac in many grocery stores, including Whole Foods, or on Amazon. Disclosure: Special thanks to noosa for sponsoring this post! And thanks to you for supporting the brands that keep Snixy Kitchen cooking! these photos are soo gorgeous. 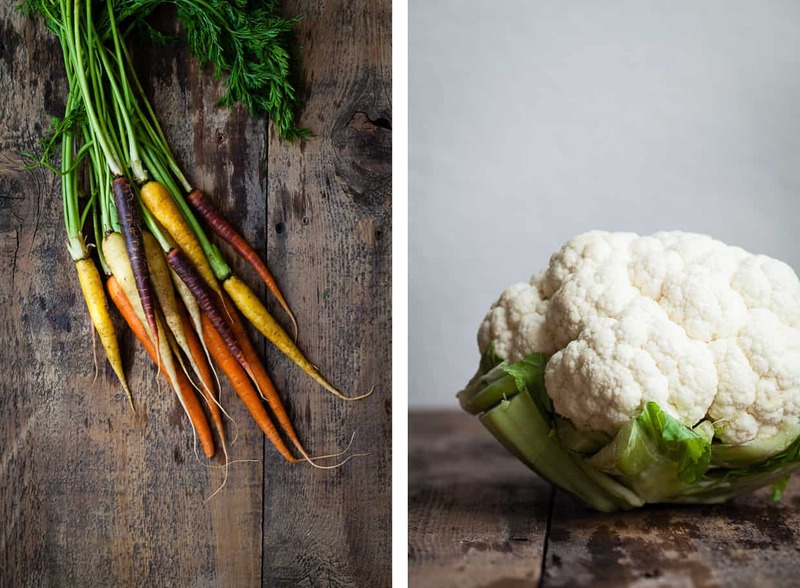 you totally captured the beautiful contrast of hot, herbaceous carrot, and the cool, mild yogurt. i loved your story about kitty love, too. it’s always funny to reflect on kitty love unfavorably for a minute. “wait, so.. I’m just your ape?.. 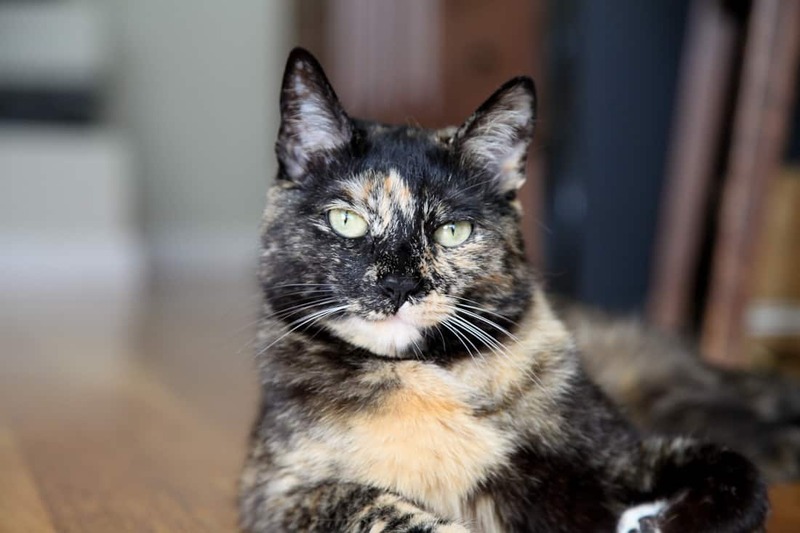 NAH, you must love me SO MUCH.” oh, cats–they’re the best (and they know it. This looks so amazing! I love the story about your kitty’s morning routine. My cat Cupcake loves all dairy (butter, cream, and yogurt especially–and also slivered almonds!) so I’d definitely have to fight her off to eat any of this. I’m so glad you explained what Za’atar is!!! I have been too lazy to Google apparently and had been wondering about it. It sounds amazing! Especially when combined with sweet roasted carrots on top of YOGURT!! I will battle your cats for this stuff any day. PS love noosa!!! I will definitely try these.Jeff and I both like carrots and I like the Z’atar flavor .It is on my list to try.Thanks Sarah! Your kitties sound so wonderful! I wish I had some furry felines to wake me up in the morning! 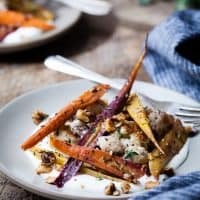 I really like the idea of making a salty yogurt, usually I always use it for sweeter things and I’m running out of things put on my roasted vegetables. This dish looks lovely! 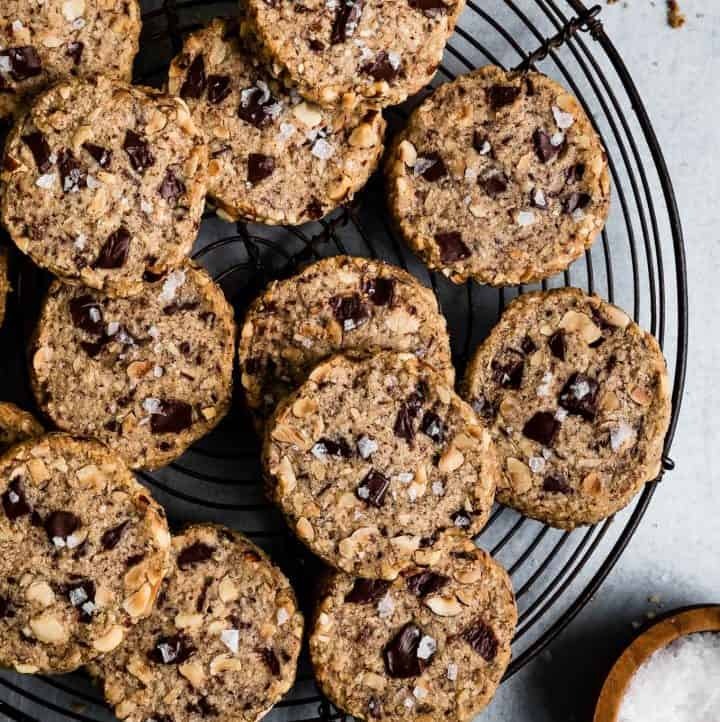 where is the za’atar in this recipe?? Za’atar is a blend of spices typically made up of sumac, thyme, sesame seeds, and a bit of salt – for this recipe, I made my own spice mix by combining the blend. You could replace with equal amounts of a store-bought blend if you like! 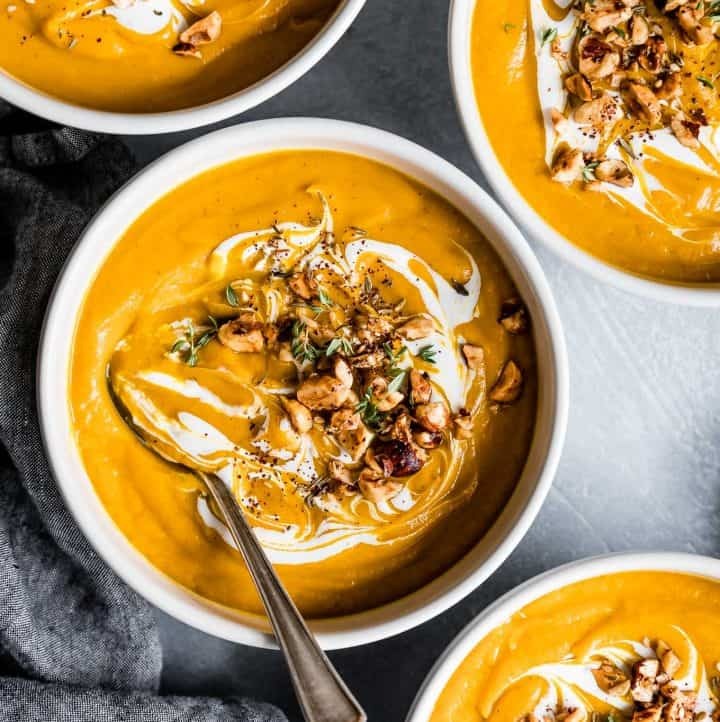 This veggie and yogurt combo sounds delicious and definitely flavorsome. 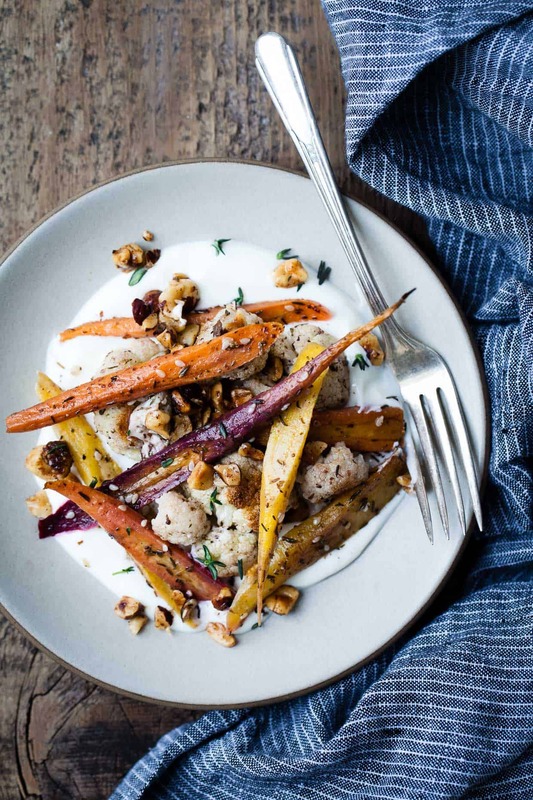 Good to know I am not the only one who likes to pair roasted veggies with yogurt. I’d probably add my favorite herbs – bits of cilantro/mint for extra crunch. Thank you for this handy side dish inspiration. True zaatar herb is a rare find in the US, even in mixes bought from ethnic food stores. Without the actual zaatar herb grown in the middle East, you’ll never get the original taste of the classic blend. For other readers shopping online, my advice is to search for premium grade zaatar herb or zero-filling za’atar.